The preceding statements close the ODS listing destination for the duration of the PROC HPMIXED run. This avoids displaying the long random-effects solution table, since only the top few EBVs are of interest. Output 48.1.1 displays the EBVs of the top 10 animals, along with their precision and confidence bounds. Moreover, for a given analysis, if the size of the problem is increased in such a way that the underlying matrices become sparser, the relative performance of PROC HPMIXED gets even better. As an illustration of this, Output 48.1.2 shows relative performance of the three procedures for simulated data as the number of farms increases. For this plot, each additional farm adds 500 levels of the Animal random effect to the model—a substantial number. The vertical axis in Output 48.1.2 measures run time, but the units are omitted: relative performance is what counts, and that is expected to be fairly invariant to machine architecture. 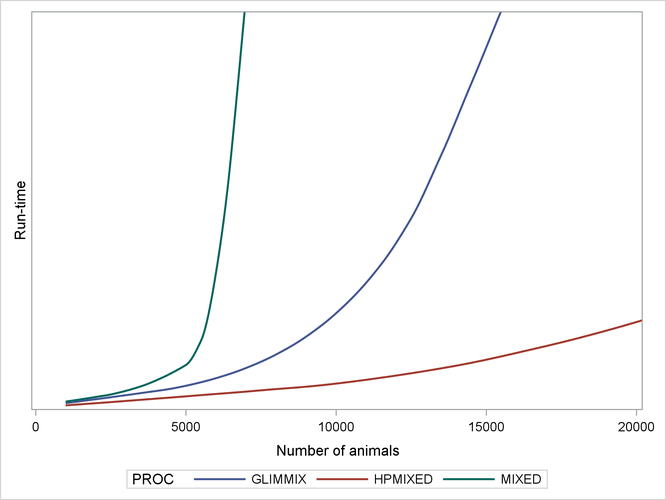 The output shows that while the performance of the MIXED and GLIMMIX procedures is relatively competitive with PROC HPMIXED for up to 3000 or 4000 animals, both procedures’ relative performance decreases as the number of animals increases into the tens of thousands. 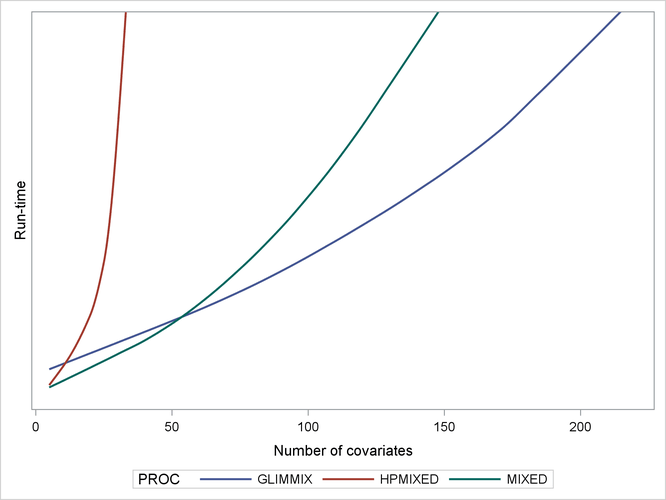 As a caveat, note that PROC HPMIXED can be inefficient relative to PROC MIXED and PROC GLIMMIX for models and data that are not sparse, because it can take many times longer to invert a large, dense matrix by sparse techniques. For example, Output 48.1.3 shows relative performance of the three procedures for simulated data like the preceding, but where the fixed part of the model consists of an increasing number of continuous covariates and is thus dense.